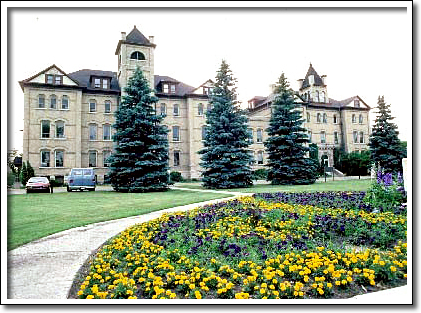 Higher education in western Manitoba traces its beginnings to Rapid City where in 1880 the Baptist community established Prairie College. In 1884 Prairie College was incorporated into the new McKee Academy, which in 1890 was relocated to Brandon. Brandon College was formally established by the Baptist Union of Canada in 1899 and became an affiliate of Ontario's McMaster University in 1910. Financial difficulties forced the Church to withdraw its support in 1938, after which Brandon was incorporated as a non-denominational college of the University of Manitoba. Brandon University was established as an independent institution in July, 1967. The original Brandon College building was completed in 1901. It was designed by Winnipeg architect Hugh McCowan (1841–1908). Although resembling other educational structures being constructed in Winnipeg during this period, Brandon College was a somewhat larger, more dignified and distinctive structure. Built of locally produced brick and Manitoba limestone, this imposing edifice displays a handsome Romanesque tower with graceful arches and small turrets at each corner.